Normally when a comic reaches its conclusion (be it the end of an arc in an ongoing, the last issue of a mini/maxi-series) almost all of the questions that have been raised are answered for readers (with maybe one or two left behind for a potential sequel or the next story-arc). 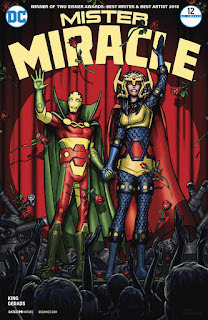 The concluding issue of, "Mister Miracle," by Tom King and Mitch Gerads does not do that however. It just lets most of the questions we readers have been puzzling-over throughout the run be raised and just sit there, unanswered. The book instead basically says, "Well, what do you think the right interpretation is?" and has us, the readers, discuss. It's both clever and infuriating. Did the book's hero, Scot Free, in fact stop an evil force, or did he die in the first issue and has been trapped in some form of Heaven or Hell (depending whom you ask)? Does his story take place in the DC Universe before Flashpoint, after, or is it even completely unrelated to the regular DC Universe and in its own strange place? Is the relatively happy ending we are witnessing in the book all a lie and Scot Free didn't die in the first issue but maybe a later one a the dude seemed prone to getting hurt or hit with anti-life beams, is he trapped in an alternate reality? Nobody knows, everyone online is guessing, and the book even says at the end to not expect any kind of continuation of this story, instead expect another interesting comic from King and Gerads in the near-future. This was among my favorite comics in 2017 and I still loved it with this ending, but boy am I befuddled. I guess all I can do is say, "Darkseid is," and accept that the lack of answers King and Gerads wanted to provide are in a way a part of the story itself.